35mm glass bottom dish, dish size 35mm, well size 14mm, #0 cover glass(0.085mm-0.115mm). Designed for high resolution imaging such as confocal microscopy. 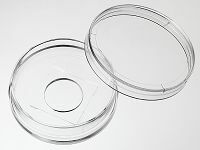 Note: We found that a small percentage of microscope adapters are too small for our 35 mm glass bottom dishes. Please check carefully the dimension diagram. If your adapter is too small, you should use our 29 mm glass bottom dish instead. D35-14-0-N , request a free sample or get a quote. Dish made from virgin polystyrene, tissue culture treated. A USP class VI adhesive is used to assemble the cover glass and the dish. » View technical specification of different coverslips. Quote: "For imaging, glands were transferred to a 35-mm #0 glass-bottom dish, with 14 mm Bottom Well (Cellvis D35-14-0-N),"
Quote: "For imaging, glands were trasnferred to a 35mm #0 Glass Bottom Dish, with 14mm Bottom Well (Cellvis D35-14-0-N)"